Under the TRAIN law, the next tranche of the fuel tax rate increase can be suspended if the three-month average of Dubai crude reaches $80 per barrel. MANILA, Philippines — President Rodrigo Duterte, at a Cabinet meeting on Tuesday night, approved the implementation of a new round of increases in the excise tax on fuel. In October, the government considered putting off a fresh increase in excise taxes, citing high global fuel prices. Economic managers said last week, however, that there is no longer any need for a suspension. Finance Secretary Carlos Dominguez III said "the recommendation comes in light of the favorable outlook in world oil prices, where the Dubai crude oil prices have gone down by 14 percent from an average of $79 per barrel in October down to $68 per barrel so far in November." The Palace, in a statement Tuesday, said current oil prices of $52-53 per barrel are too low for a provision in the Tax Reform for Acceleration and Inclusion (TRAIN) Law that would trigger a suspension of the next round of excise tax hikes. Under that provision, increases will be suspended if global prices are at $80 or higher for three consecutive months. In October, Energy Secretary Alfonso Cusi said the departments was "preparing a formal memo to the Office of the President to seek the suspension of the collection of excise taxes on petroleum products" because it seemed global prices would remain high. 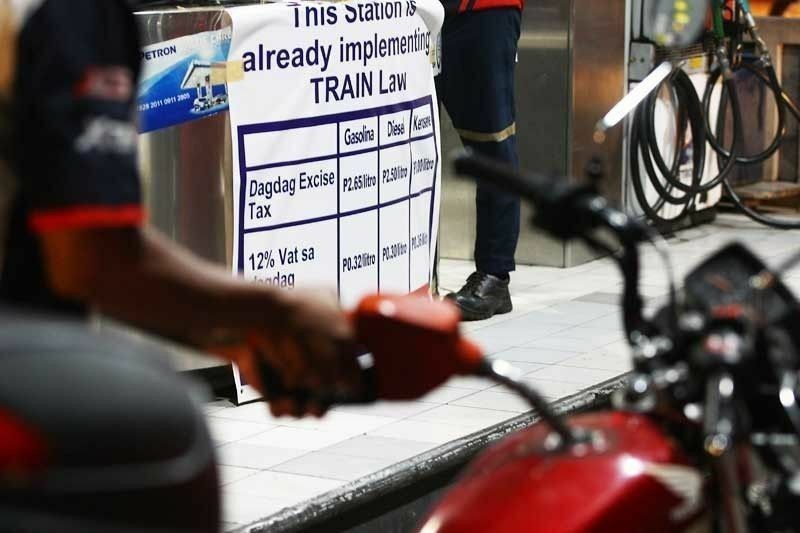 Under the TRAIN Law, the government has imposed a P7 per liter tax on diesel, cooking gas, kerosene and bunker fuel as well as higher taxes on gasoline staggered over three years. It imposed a new tax of P2.50 per liter or kilogram on diesel, cooking gas, kerosene and bunker oil for electricity generation and raised the excise tax on gasoline to P7 from P4.35 per liter in 2018. Under the law, the excise tax on fuel products is supposed go up another P2 per liter next year. On Monday, the Land Transportation Franchising and Regulatory Board issued a resolution rolling back jeepney fares to P9 from P10 in Central Luzon, Calabarzon and Metro Manila. The cuts were made in compliance with Transportation Secretary Arthur Tugade’s directive to the LTFRB to roll back fares amid declining world oil prices. While the decision rolls back fares by P1, it was hiked P2 in two tranches, from a fare of P8 to P10 last July 6 and November 4.